The integration of radars on cars represents a major issue, as well as for clients than for suppliers, coupled with a technical challenge. 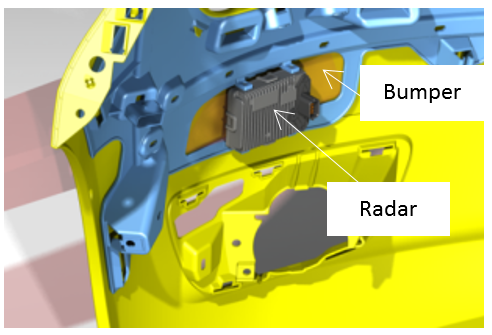 Indeed, in most cases, cars manufacturers want to hide and/or protect radar sensor(s) by dissimulating it or them behind a bumper protection (illustration n°1), a hatch or a logo (illustration n°2). In this context, the integration item has to be optimized as an hyper frequency component in order to limit the impact on the radar performances. Furthermore, each vehicle platform has its own integration constraints, in terms of radar localization, and the nature of the parts that surround and integrate it. Hyper frequency constraints associated with the functioning of the radar: definition of a sensibility scale given to the manufacturers. Each material constituent of the vehicle components likely to interact with the radar (integration item or the radar environment) has to be characterized from a hyper frequency point of view. This characterization makes it possible to identify the materials, when they interact with the signal of the radar. A test bench was developed internally to allow us to make those characterizations (illustration n°3). Illustration n°3: Characterization benches materials. On one hand, the support consists in interacting with the manufacturer to provide him with designing rules of the integration component (materials, thickness, geometry, its placements regarding the radar, …), so as to guide him towards effective integration solutions, simple and reliable in their implementation, and less expensive. On the other hand, each manufacturer integration proposal is validated by the electromagnetic simulation, then by the measure.